Update 9:45 p.m. Information about the cause of the outage and witness accounts added. Update 9:15 p.m. Power has been restored. ST. GEORGE — A power outage affected about 500 customers in areas of western and southwestern St. George Sunday evening. Outages were reported along Bluff Street from Interstate 15 to approximately 700 South and Main Street from Bluff to approximately 100 South, as well as portions of East Riverside Drive and Sunland Drive on the other side of I-15. René Fleming with St. George Energy Services confirmed that the Flood Street Substation was affected. “Crews surveyed the line, and they found bad insulators – a faulty piece of equipment. So, they repaired that, and now power has been fully restored,” St. George Support Services Director Marc Mortensen said of the cause. Gerund Bunting, a witness in the area at the time of the outage, said he heard an explosion and saw sparks and a flame about 10 feet tall come from the substation just before the lights went out in surrounding residences. 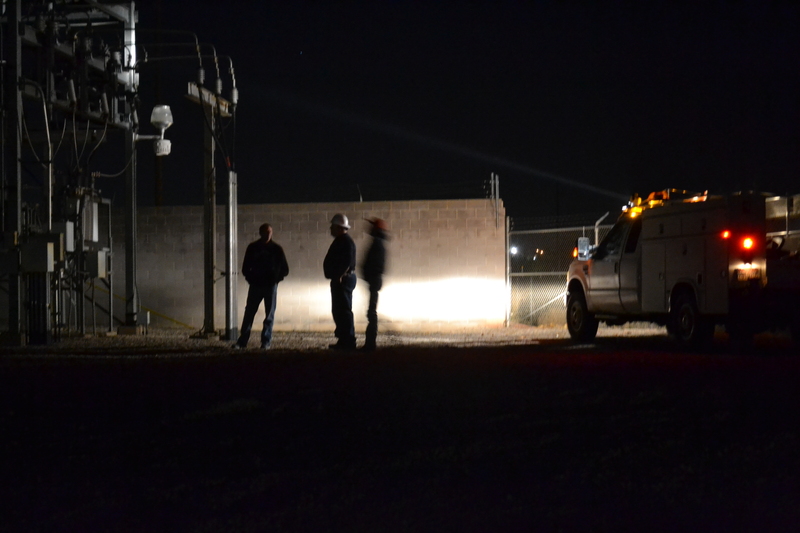 St. George News reporter Ric Wayman was reporting from the substation at 400 East 1160 South at about 8:40 p.m. when he observed one of the repair crews open a panel about 100 feet away from the substation. A second later, a bright white fireball exploded above the substation with a resounding popping noise. Another fireball, brighter than the first, rose from the grid then disappeared, leaving a plume of smoke above the substation. The outage was originally reported just before 8 p.m.